A new plant appeared suddenly by our front door about a month ago. It was rather attractive, with a splash of purple on its first leaves, so I gave it favored weed status and did not root it out. 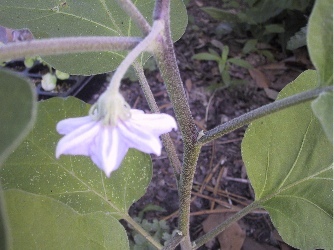 Then a bloom appeared whose pale violet fused petals and waxy yellow stamens (almost forming a tube around the pistil) made it look very much like a potato flower. The leaves weren't like a potato's, though; a potato has deeply divided leaves. Nightshade? Again very similar, but its petals curve back more than our mystery plant. Its hairs made me itch for hours after I touched it, though it lacked any obvious thorns. 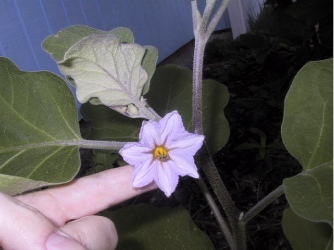 I decided that it must be a horse nettle, though with less deeply toothed leaves, only to see a guidebook-perfect example of a horse nettle that very afternoon, growing on the roadside. Finally we found pictures of eggplants which look identical in every respect. We're pretty sure it is an eggplant. We won't really know until a fruit appears. 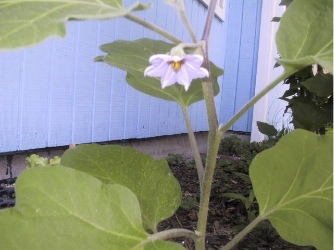 The first flower fell off peduncle and all, but we have hopes for the newer flowers. How could an eggplant have come to grow there, when we never planted it? Compost. An eggplant went bad and was discarded instead of being eaten. We did use compost in that area.